This is the culmination of a long running commission to build a puzzle box to hold an engagement ring. The box was designed in collaboration with the client. He wanted it to include puzzles specific to their lives and relationship. 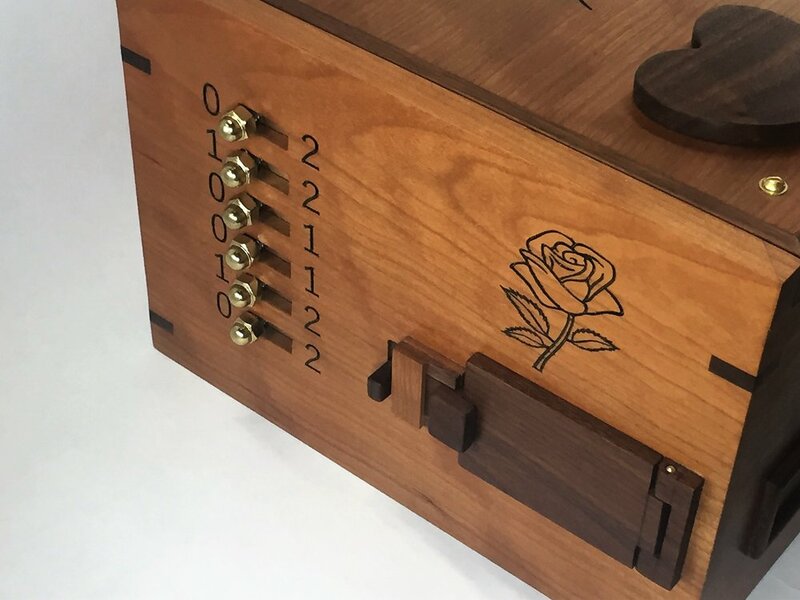 I designed this box to have 4 different puzzles to solve on the way to retrieving the ring. Solving the sides gets you the keys to open the top, but where to the keys go? Once you get the top open you are met by a cryptex. Once it’s secret is released you can release the drawer where an iris is found. Open the iris and at last, take the treasure. 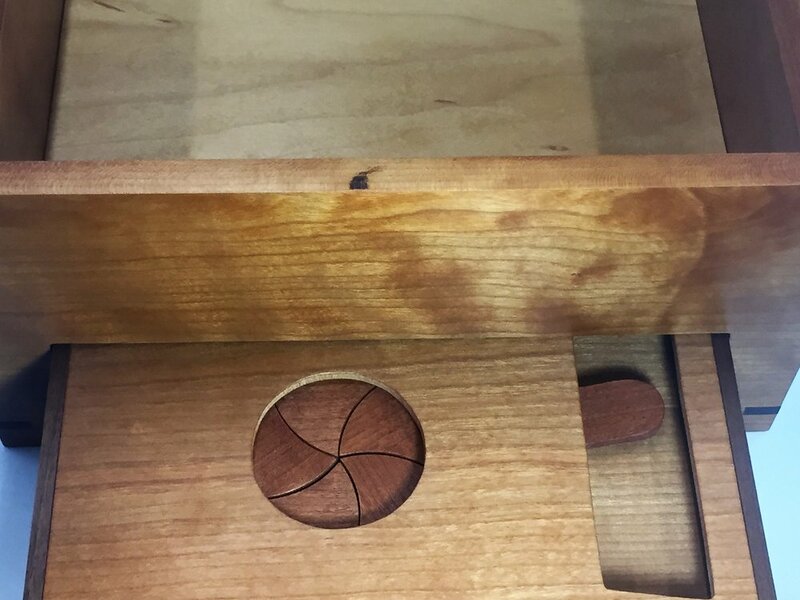 This box is made from a cherry as the primary wood, walnut for accents and some cherry and maple plywood. The cherry has already started to darken in these pictures and it will continue to develop more character as it ages further. The names, numbers and designs are all CNC carved and then paint filled to make them really stand out. 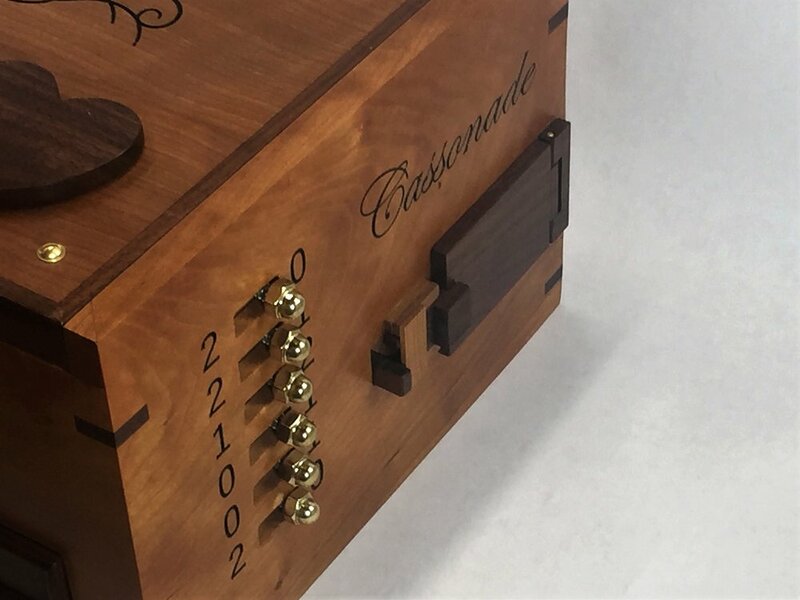 The cryptex is made from rotating wood segments attached to PVC with steel pins as the locks. The letters on it are all CNC engraved. 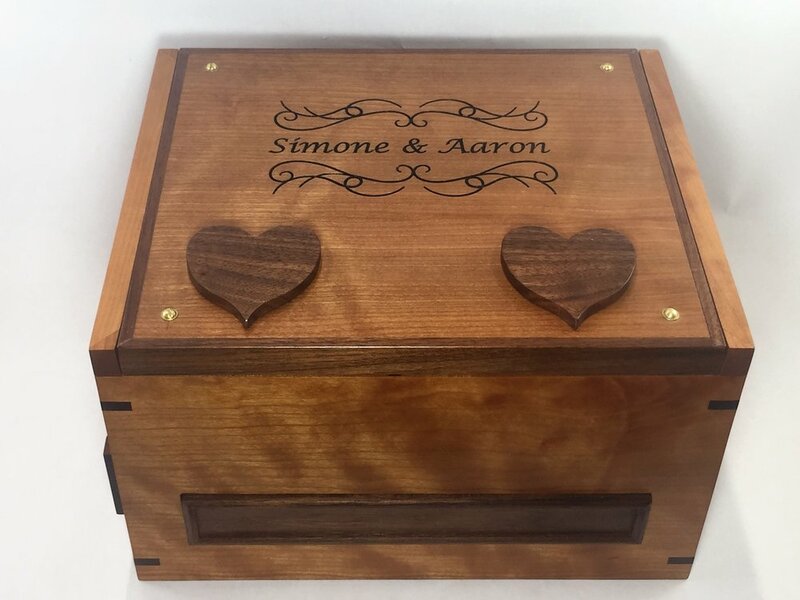 As this box is meant to be used for an engagement and kept as an heirloom I designed it with longevity in mind. All of the puzzle components are accessible in the event a repair is needed. These types of boxes, with lots of moving parts, I feel should have a means of repair available. This was a long but very enjoyable project that taught me several new skills. We wanted to add a laser engraved image inside the lid but I was having trouble procuring a means of doing that. Instead, I learned how to perform an image transfer and that is inside the lid (I don’t show the image to protect the client). After a few tries I got rather good at making the iris mechanism too. Figuring out how to make the cryptex was challenging, especially figuring out how to carve the letters but the result was very rewarding. This box measures about 13” wide, 12” deep and 10” tall. With the cryptex inside it weighs about 9 lbs. It is one of a kind and I will not make another like this again.